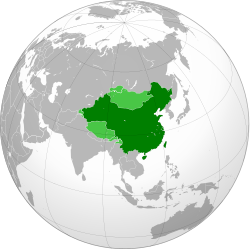 The Republic o Cheenae (traditeeonal Cheenese: 中華民國; simplifeed Cheenese: 中华民国; pinyin: Zhōnghuá Mínguó; Wade–Giles: Chung1-hua2 Min2-kuo2) wis foondit in 1912 an it govrened mainland Cheenae till 1949, when it lost the mainland durin the Cheenese Ceevil War an widrew tae Taiwan. As an era o mainland Cheenese history, the republic wis precedit bi the Qing Dynasty an followed bi the Fowkrepublic o Cheenae. Its first preses, Sun Yat-sen only served briefly. His Kuomintang (KMT, or "Nationalist Pairty"), then led bi Song Jiaoren, wan a parliamentary election held in December 1912. However, airmy leaders o the Beiyang clique, led bi Preses Yuan Shikai, retained control o the central govrenment. Efter Yuan's daith in 1916, local militar leaders, or warlords, assertit autonomy. In 1925, the KMT established a rival govrenment, referred tae as Naitionalist Cheenae, in the soothren ceety o Canton (Guangzhou). The economy o the North, owertaxed tae support warlord adventurism, collapsed in 1927–1928. In 1928, Chiang Kai-shek, who acame KMT leader efter Sun's daith, defeatit the warlord airmies in the Northren Expedition. Chiang's Naitional Revolutionary Airmy wis airmed bi the Soviet Union an wis advised bi Mikhail Borodin. The Beiyang airmy wis backed bi Japan. Ance Chiang established a unified central govrenment in Nanjing, he cut his ties wi the communists an expelled them frae the KMT. There wis industrialization an modrenization, but also conflict atween the Naitionalist govrenment in Nanjing, the Communist Pairty o Cheenae, remnant warlords, an Japan. Naition-biggin teuk a backseat tae war wi Japan in 1937 – 1945. Japan occupied coastal auries an cut aff Cheenae's access tae seaports, while the KMT retreatit tae Chongqing. The Burma Road, an later the Ledo Road, wur built tae allow US "lend-lease" aid tae reach the Cheenese airmy. The Naitionalists' Y Force drove back the Japanese in Yunnan durin a Mey–Juin 1944 offensive, but etherwise militar results wur disappointin. Efter Japan surrendered, the Cauld War atween the U.S. an Soviet Union led tae renewed fichtin atween the KMT an the communists. In 1947, the Constitution o the Republic o Cheenae replaced the Organic Law o 1928 as the kintra's fundamental law. In 1949, the Communists established the Fowkrepublic o Cheenae on the mainlaund, while the Naitionalists retreatit tae Taiwan, an despite its vastly reduced territory, the Naitionalist govrenment continued tae be recognized as the govrenment o Cheenae bi non-Communist states well intae the 1970s. This page wis last eeditit on 13 August 2017, at 08:33.